I dip dyed my hair purple a while ago and did a post on it (here). I wanted to do a separate review on the hair dye because that post was getting too long and I couldn't really include it in there. 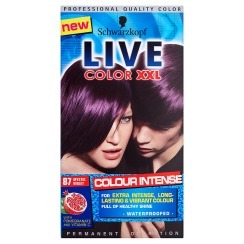 This product retails at £5.59 in Superdrug which I think is a decent price for a hair dye. It claims to be 'waterproof' and therefore is longer lasting. I had bleached my hair prior to applying the hair dye because I didn't think the dye was going to show up on my dyed black hair. My hair was a bright ginger colour before I dyed it and unfortunately it showed up darker than I wanted it to be. The colour blended in with the rest of my hair in dull lighting (indoors) but underneath sunlight, it shows up as more of a wine colour rather than a deep purple that I had originally wanted. As for the lastingness, it did wash out a lot in the first few washes. I could see a lot of colour washing out of my hair but ultimately that made the colour more vibrant (but more of a red). Unfortunately, I had to swim once every week after I dyed my hair which caused it to wash out even more quickly. Immediately after I swam the first week I noticed a significant difference in the colour. Eventually, after 2-3 weeks it turned into more of a dull reddish-gingery colour. Of course, I didn't take any photos of my purple hair and now I've chopped all of the ends off. But overall the colour lasts a decent amount of time considering purple/red is a very hard colour to maintain. One main tip is to try to wash your hair with cold water and also to avoid swimming to keep the hair colour in for as long as possible.